Over 2/3 of all cell phone usage is from indoors where DAS may be required for proper coverage. A system using antennas outside the building and distribution throughout the building on coax cable is called an active DAS. DAS antennas generally have much lower power levels than outdoor antennas on a tower. 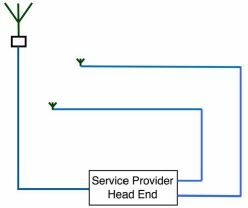 A neutral host DAS allows sharing the cost among multiple service providers while providing better service for all users. WiFi and DAS are incompatible and never share networks. Carrier owned DAS never share the networks with other service providers. 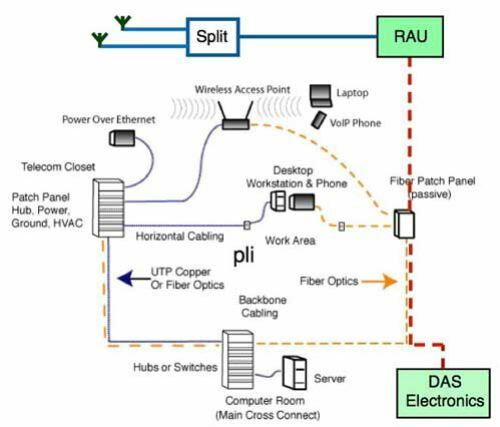 An active DAS distributes digital signals over fiber optics to the ______. Remote antennas connect to RAUs in an active DAS over ______. 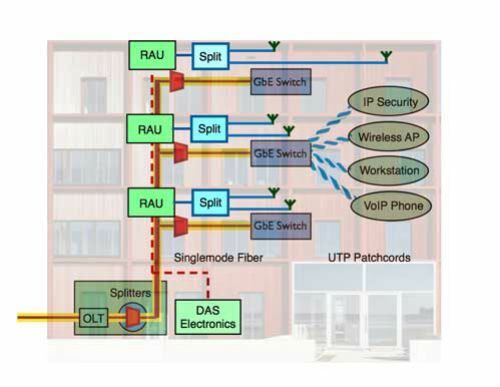 The passive DAS in the drawing below uses ______ cables and amplifiers to distribute wireless signals in a building. The diagram below shows how DAS cabling is similar to and compatible with ________ networks. What are the reasons for installing a DAS?